Out of place in the post, but doesn't it look lovely. Amanda Herbert's dishes taste as good as they look. Pick the newly-married couple: how young they look! Dinner at the Tower Mill. Himself enjoying his Mediterranean seafood platter in Aix while my tagine awaits! This week’s topic in the series devised by Amy Coffin and Geneabloggers is: Restaurants. What was your favorite local restaurant as a child? Where was it located, and what was your favorite meal? Did you know the staff personally? What is your favorite restaurant now? Firstly my apologies for the weird placement of photos -Wordpress and I are not friends tonight – I’ve been doing all the usual things and the photos just don’t want to go where I’ve put them. My patience has expired after multiple tries so here it is, albeit not with logical photo placement. This week’s topic is an interesting question from a generational perspective. Perhaps I’m wrong but I’d have said that very few families in Brisbane ate in restaurants when I was a child. Not only was it culturally unusual, it was almost certainly economically unsustainable for most families. Nor were there the lower-income restaurant chains that have been imported from the US and which kept my kids in earning capacity during their uni years! It was only as a teenager that I ever ate out at a restaurant and I imagine it was part of my adult socialisation. My mother and I would very occasionally go to a Chinese restaurant in Wickham St, Fortitude Valley (the Valley) in Brisbane. I’m pretty sure that we ate very pedestrian fare such as sweet and sour pork or chicken chow mein: it must be remembered that Brisbane, and Australia in general, was very much a “meat and three veg” society at the time. For the life of me I can’t recall the name of the restaurant though I know it was on the first floor of a building, up some stairs, near the corner of Wickham and Brunswick Streets. I have a vague idea that the pub nearby, and possibly this restaurant, was burnt down in the mid-late 1990s. I certainly know that in the late 1980s we ate there again with my daughter’s boyfriend’s Cantonese-Australian parents, and it was assuredly not mundane sweet and sour pork! I also distinctly remember being invited to my Italian best friend’s sister’s Confirmation party, also in the Valley, at an Italian restaurant (the Valley had lively Chinese and Italian influences). Most of the party spoke Italian only and I was exposed to food I’d never experienced before like olives! It was a great insight into new food and socio-cultural celebrations. 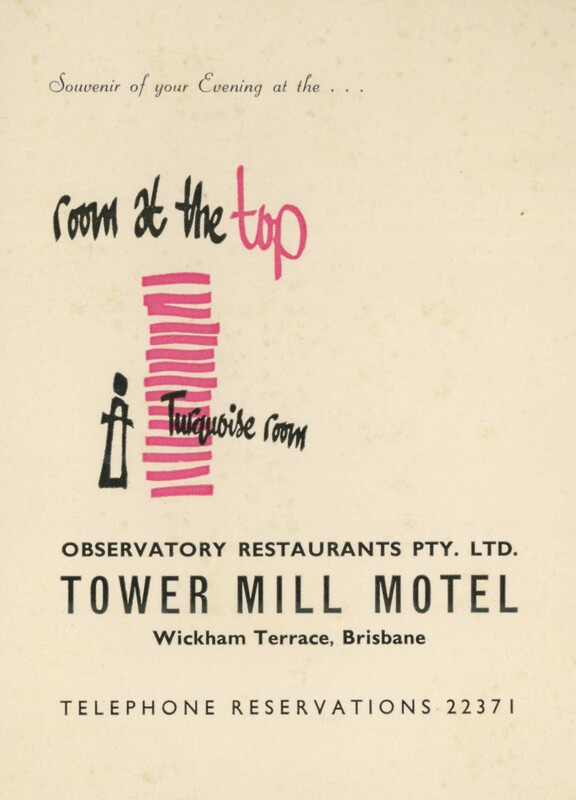 Another dining “event” was a dinner at Brisbane’s revolving restaurant, The Tower Mill[i], named for its proximity to one of Brisbane’s surviving convict-era icons, a windmill which was used to grind grain. The Tower Mill was also a revolving restaurant so was seen as quite “the thing” for a special night out. My very good school friend and I were taken there by her godparents to celebrate graduating from high school. 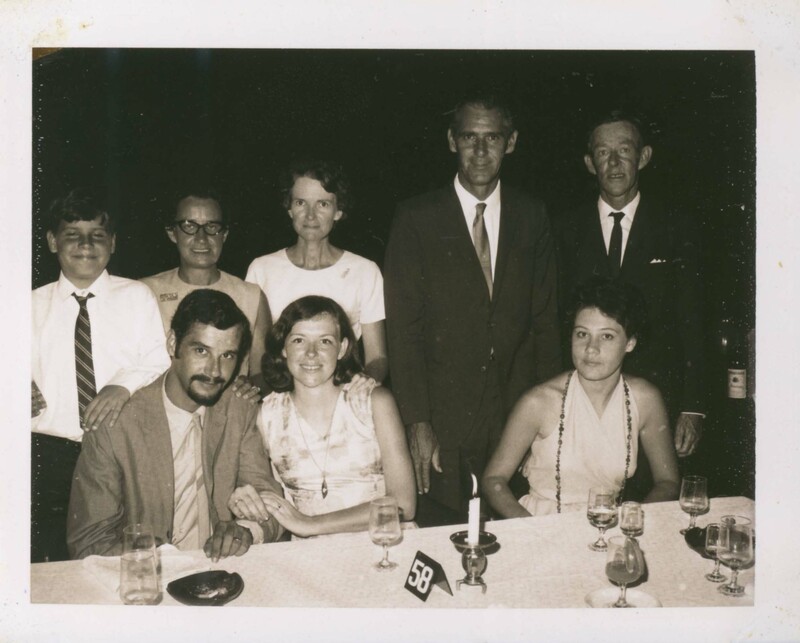 A few years later we celebrated my recently-married husband’s 21st birthday there with his family. A flash dinner out at a restaurant was a rare enough event that photographers came to each table to record the event with a Polaroid camera. Perhaps it was also that not everyone had a camera as well – hard to imagine in these days of digital cameras and mobile phones with cameras. This reminded me of a later trend in some restaurants where people came around selling roses. Another dining “event” (there really wasn’t any other sort) was a hot date with my fiance to a theatre restaurant -perhaps our one and only such outing (oh yes, apart from a fondue and yodelling restaurant in Switzerland!) and as I have virtually no memory of it, we can’t have been impressed. While not restaurant-based, another food memory is when I worked for a Greek-born couple who owned a fruit and veg shop. 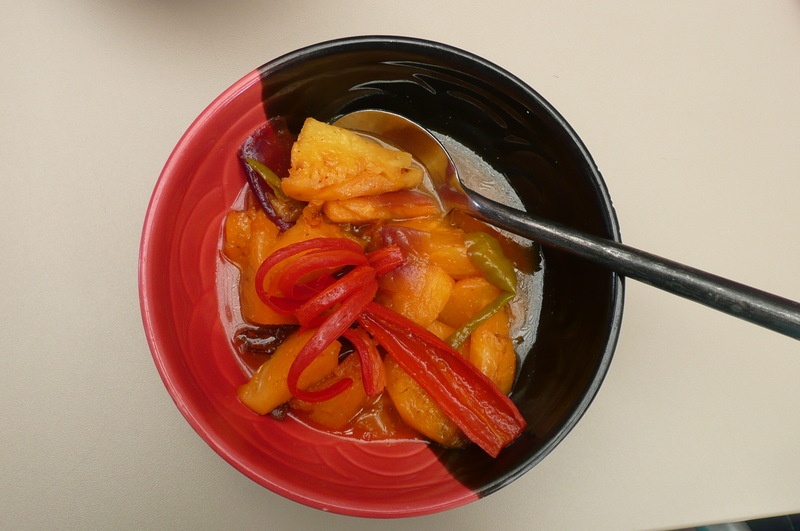 The exotic array of food I’d never encountered simply boggled my brain – capsicum, broccoli, mushrooms –it’s hard to put my culinary memory back in that place. Not to mention the octopus sandwiches! The fact that so few restaurant memories come to mind from my childhood tells you that it was a rare and uncommon event. Even in Papua New Guinea, restaurant meals were few and far between though in Moresby we ate fantastic (and cheap!) lobster mornay at the Aviat Club and had a memorable lunch outing for my birthday one year when my husband presented me with a fantastic, imported, floral array. Expo 88 was, to my mind, a benchmark in Brisbane’s cultural coming-of-age. While the various cuisines had been there for some time, even decades, their influence and the whole al fresco dining and restaurant-eating-out really came to the fore after Expo. Like many Australians our food has become increasingly influenced by Asia and this is especially the case in the Darwin where the markets are stocked with Asian ingredients. A culinary delight is attending one of one of Amanda Herbert’s cooking classes at Hanuman Restaurant. Even though we cook a lot of Asian/Indian meals, this remains a real treat, not to mention a bargain! What restaurants do I enjoy now? Well ethic probably is the easiest description though Australian fusion ranks highly. What do I expect from a restaurant? Good service (hard to find in Darwin with transient back-packer staff) and food that is unusual and excellent in its production, using quality ingredients. We are really disappointed when we’re served something we could have cooked at home! We have fond memories of a restaurant on the banks of the lake in Zurich many, many years ago when the maitre d’ was incredibly professional in his approach to two young people who plainly had no idea, not much money and were out of their depth. At no point did we feel he’d patronised us or that he thought our custom beneath him which taught us a lot about truly high-quality restaurants. 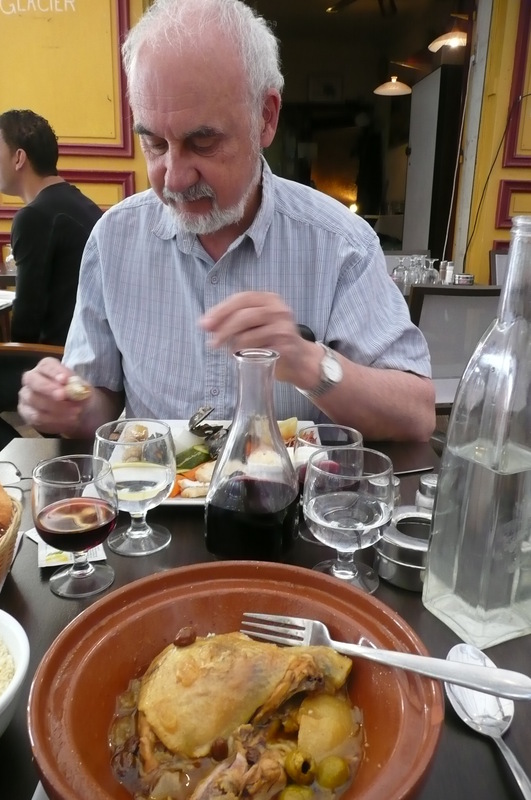 On a recent trip to the UK and France we had some very nice meals but the one that stands out for me is the meal in Aix-en-Provence when my husband ate seafood and I had a Chicken Tagine, all served by a waiter who’d worked in Darwin! The meal was delicious albeit simple. So where do we eat in Darwin? I’m pretty unforgiving when my meal is completely forgotten or service is appalling – so the beautifully-located Pee Wee’s on the Point has been off my list for many a year which is a shame.Hanuman remains a perennial favourite for special meals and their food is spectacular. There are other places that are okay for day-to-day events but Hanuman is “up there”. We’ve had some very nice meals at Il Lido, from brunch through to dinner. Its waterfront location with views of pelicans, in season, is hard to beat when the service and cooking is “on fire”. There used to be a good restaurant called “10 Litchfield” with a Kiwi waiter whose service standard and client knowledge was international but it has, sadly, long gone. [i] Now the Metro Tower Mill motel. This entry was posted in 52 weeks of Personal Genealogy & History, Brisbane, Cass family history, Family History, Kunkel Family History, Life in the Top End, Local History, Papua New Guinea and tagged 52 weeks of personal genealogy & history, Aix en Provence, Amanda Herbert, Brisbane, cuisine, culinary, culture, Darwin, food, Hanuman, Il Lido, port moresby, Tower Mill by cassmob. Bookmark the permalink.